The Super Falcons did not come into this game as favourites for the first time in recent years and very rare in the history of the tournament. Nigeria had lost their opening game of AWCON 2018 to South Africa and the Bayana Bayana came into the final with a lot of confidence. The South Africans started the game on the front foot with Jermaine Seoposenwe trying a shot from the 25 yards out which Nigeria goalkeeper Oluehi Tochukwu comfortably collected. Asisat Oshoala threatened for the Super Falcons with a header two minutes later but South Africa goalkeeper, Christen Swart was at the right place at the right time. Despite the barren scoreline, the game was lively and end to end as both teams tried to get the goals. Oshoala had a chance from the penalty spot in the 72nd minute as Francisca Ordega was fouled in the box but the reigning Africa’s Women’s Player of the Year went wide with her effort. At the end of 90 minutes and extra time without a goal, the final for the first time in the history of the competition went into penalties. Nigeria missed their first spot-kick but South Africa missed two to give the Super Falcons a 4-3 win to give them their third consecutive AWCON title and their ninth in history. 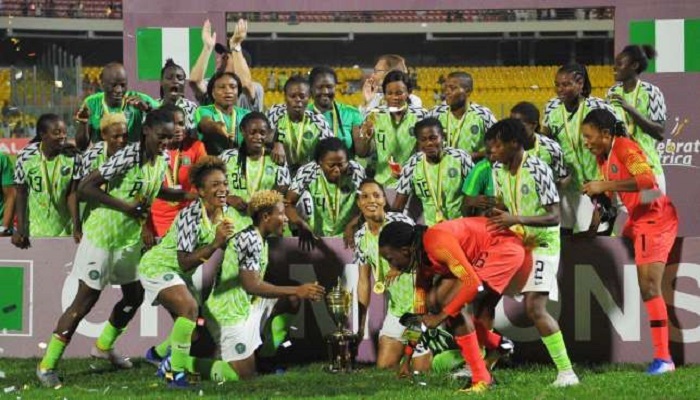 Super Falcons’ Ordega was named Woman of the Match while South African forward Chrestinah Thembi Kgatlana was adjudged the Woman of the Competition, the award given to the best player at AWCON 2018.